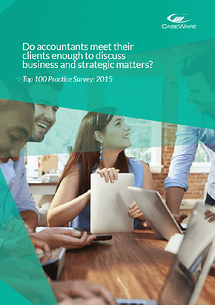 Do accountants meet their clients enough to discuss business and stratetic matters? Twice a year CaseWare survey accountants from the top 100 practices in the UK to find out what important issues and industry challenges affect how they conduct their business. Analysising responses from our customers, who are typically large and mid-sized accountancy firms and consist of 50% of the top 100 accountancy firms in the UK, this report looks at how much time partners spend meeting with their clients to discuss strategic and business matters. - How often do partners meet their clients? - Do they feel this is sufficient? - If not, what prevents them from meeting clients more often? - Are these meetings charged?